Are you confused by the Young Living Essential Rewards programme? Don’t worry, you’re in good company because it baffled me when I first signed up! It’s good that you’re taking the time to research it though because there are no downsides or catches to the Essential Rewards (ER) programme and the sooner you sign up the better off you’ll be. In a nutshell the ER programme rewards you with discounted shipping and free points that you can collect and then redeem for essential oils and other products. Oh and if you spend a certain amount each month you can qualify for the free product of the month. 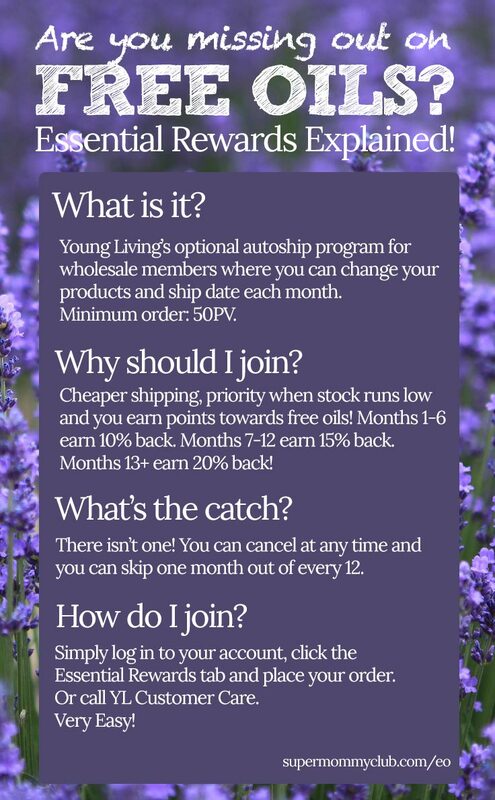 In order to join the ER programme you need to be a wholesale member of Young Living. This programme is not available to retail customers. How much does it cost to join the programme? Nothing, zilch, nada. It’s free to join, and you can cancel at any time and go back to buying your products as and when you want to (but you would lose the perks of the scheme). Yep, you need to order a minimum of 50PV each month to be an ER member. Do I have to order the same thing every month? Nope. This is the part that confused me. You can change the items in your shopping cart each month, and you can even change the date your items ship. You just need to login to the Virtual Office to make the changes. Are there only certain products I can order through ER? Nope. Again I was confused by this one. You can order whatever products you like through ER. There are some special ER only bundles though that let you save even more money. You can see them in your product brochure or online in the Virtual Office. You earn points on each order to put towards free oils: Months 1-6 – earn 10% back in points, Months 7-12 earn 15% back in points. From month 13 onwards you earn 20% back in points! Free products. In addition to being able to redeem your points for free products Young Living gives away products to ER members each month if you spend a certain amount of PV in your order. Check the Virtual Offer for this months’ freebies. In addition to these benefits, if you are taking advantage of Young Living’s referral scheme to earn bonuses and commissions by signing up your friends and family, or running a Young Living business, then placing a 100PV ER order each month qualifies you for additional bonuses. And you’re sure there is no catch? Yep. Sounds crazy but it’s true! You can cancel at any time if you decide it’s not for you, and you can skip one month out of every 12 if you need to. Just login to your account and click on the Essential Rewards tab to place your first order. If you don’t have a wholesale member account yet hop over here and I’ll show you how to set one up.